I am a big fan of hot tea, but if you can believe it, up until this past August I didn't own a tea pot. Now, I have tea pots that you pour the hot water into....but I didn't have a pot to boil water in. I know...the irony is rich. What I used to do was boil water in a pan and then make the tea in the tea pot. Not exactly stone age technology, but there was distinct room for improvement. When I went to visit my sister-in-law in Scotland in February, she had an electric water kettle that was amazing to use. It wasn't long until my mother-in-law got a Bodem one in her own home, and I was like, "Oh my god! I must have one too!!!" But I ONLY wanted the Bodem one that my mother-in-law has because it was an awesome green one and it would match my kitchen. My champagne tastes on my ramen noodle budget prevented me from going out and getting one. I would stalk them online, but I just couldn't click and purchase. Lucky for me, I have awesome family. For my birthday, my sister-in-law and my mother-in-law went in and got me my very own Bodem. I am totally in love with this thing. It boils water SO FAST! And I swear, I use this thing so much, I have no idea how I lived without it before. Lately, I have been using to make my instant coffee in the morning. During my first trimester, I have been caffeine free, and rather than brewing a whole extra pot of coffee (and battle my husband over that point) I figured instant would be the way to go. So every morning I use the Bodem to get my cup o' joe on! Also, I use to make a quick broth from bullion when I am making soups. And I have been making a ton of soups lately because they seem to be one of my favorite things during pregnancy. Can we also just talk about how positively cute this thing is?! It's modern, and lovely, and sleek and it matches my Kitchen Aid Mixer. I swear, this point makes me sooooo happy. So. Happy. 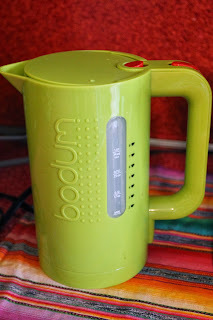 If you are looking for an electric water kettle, I have to say that this is the cream of the crop. You will love this sucker.